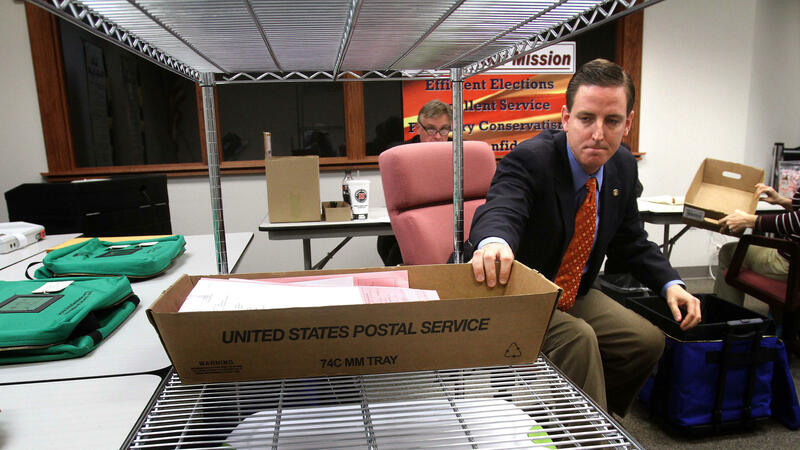 Michael Ertel in November 2012 while he was the elections supervisor of Seminole County, Fla. He resigned Thursday from his post as Florida secretary of state after photos of him in blackface emerged. His resignation came after a Florida newspaper, the Tallahassee Democrat, was given the photographs and showed them to the office of Gov. Ron DeSantis, which said it had not previously seen them. "I am submitting my resignation as Florida Secretary of State effective immediately," Ertel wrote in an email to the governor that was provided to NPR. The governor's office confirmed that his resignation had been accepted. The Democrat reports that, in the photos, Ertel's shirt – which was apparently stuffed to imitate breasts – also read "Katrina Victim," a reference to people who suffered through the hurricane that devastated the Gulf Coast earlier that year. Ertel, who confirmed to the paper that he was the man in the photos, said he wouldn't comment on the record about the circumstances surrounding them: "There's nothing I can say." The newspaper declined to say how it obtained the photos when NPR asked for those details. At a press conference on Thursday afternoon, DeSantis said the situation was "unfortunate." "I want people to be able to lead and not have these things swirling around him," DeSantis said, according to the Orlando Sentinel. "I've got to have an administration that's going to be focused on what matters to Floridians, and I don't want to get mired into kind of side-controversies." Until today, Ertel oversaw elections in a swing state whose electoral politics are often in the national spotlight. When he was tapped by DeSantis to lead the department, the Orlando Sentinel's editorial board hailed Ertel as a "savvy and efficient manager" and said his record showed no evidence of incompetence. Ertel, a U.S. Army veteran, had also served as a public information officer for Seminole County, and had worked at the state's tourism marketing agency, according to the Miami Herald. As NPR's Gene Demby told All Things Considered last year, blackface has a long and problematic history in the U.S.
"We first started seeing blackface in the early 1800s. It becomes central to minstrel shows in which white people would dress up like black people by darkening their skin with polish and with cork. And of course these minstrel shows depicted black people as lazy, as animalistic ... And that sits next to obviously this broad dehumanization that allowed slavery to happen at the time. And so these caricatures linger in the American consciousness for a long time."